This is one of the greatest books ever written to help people like me find their way in the world. 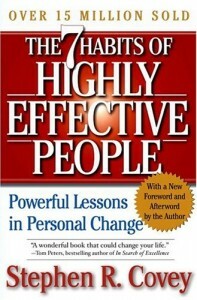 Before this book, I read lots of self-improvement books, but none of them inspired lasting change. Stephen Covey has much to say on the qualities of effective people. Covey’s purpose in detailing the seven habits is to help people improve themselves. The seven habits are woven into a tapestry on a diagram that shows the working of all seven habits in communion. When viewing the diagram, one is reminded of Benjamin Franklin’s engraving of the snake which was divided into thirteen pieces, with the caption “Join or Die.” Each of the seven habits is integral to viewing the picture as a whole, as well as seeing the development from dependence to independence to interdependence. The reader is pulled into activities for further application, to decide what type of Quadrant II activities exist, and to find what is at the center of the reader’s life in a bid to understand how paradigms work. The first three habits, which lead to independence, a private victory, lead to the final four steps, which include public victory. Be ProactiveBeing proactive is the foundation of the entire seven habits paradigm. In a sense, all the other habits are types of being proactive. This entails a realization that you are a person who can take direct control of a situation and, even if you have no actions that you are allowed to perform, you can still control your outlook. Covey begins this section with the description of the reader’s funeral as an illustration of how one end in view can change the previous years’ effort. The visualized step of seeing the end is the first part of any successful plan. The second step of a successful plan, following the visualization, is the managing step, that of physically performing the task. Out of six possible scenarios, Win/Win is the highest form of agreement between parties that empowers all involved and does not sour the milk of future relations with resentment. Covey says that this is the most immediately applicable of all the seven habits. He is right. However, this is probably the most difficult habit to practice since it requires a major paradigm shift in how one views communication. Communication is not a pipe to send information with a limited bandwidth. Rather, it is like a circuit that requires lessening of resistance to allow the proper current through. The current is the message and the resistance is our willingness to control our reaction and proactive empathic listening. Synergy is not “‘sin-energy’ the energy of sinfulness” as some punning Christian might say. Synergy is what happens when a group of independent people coalesce their creative energies and the result is more than the sum of their individual input. It is the culmination of the other habits and it requires integrity to be most effective. Synergy is a high type of compromise in which all parties maintain a Win/Win situation. When Covey details sharpening the saw, he gives the reader one final abstraction of thought, a level above the others that entails keeping all the other skills sharpened by continued planning, practice, and renewal. These are the dynamics of the saw: Physical, social, mental, and spiritual-coincidentally, these are the four dimensions of the Florida College emblem.